Our "Country Over Party" Rally gathered over 400 people at Issa's office to continue to put pressure on him to call for an independent special prosecutor. The Flip the 49th Community Organizing Training on May 20th was a great success! 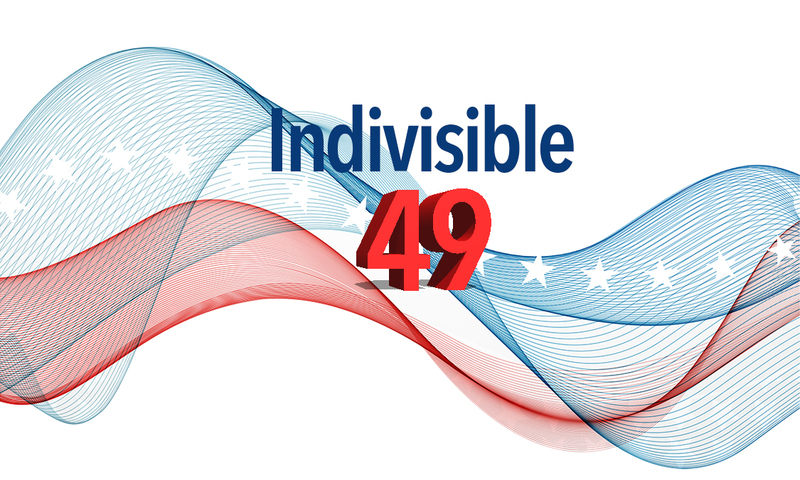 A coalition of progressive groups, including Indivisible 49, offered training to people on how to engage voters and community members through neighbor-to-neighbor and other precinct operations. Stay tuned for future training dates. Rally at Issa's office again this Tuesday at 10:00 a.m.! Our theme this week is It's Time to Clean House Bring your mops, brooms, plastic gloves, tie your hair up in a kerchief, and most importantly, bring a sponge. We will leave a couple of buckets full of sponges Darrell Issa's office. We're gathering across the street this week, so be careful crossing over. RSVP. 1800 Thibodo Road, #310, Vista. Note: we've been attempting to obtain a permit to allow us to peacefully protest here, but have not succeeded yet due to local Republicans' many roadblocks. We will protest anyway, as is our right, and will continue to try to get the permit. Call both Senators (CA) and thank them for all they’ve done to obstruct 45’s agenda so far. Ask them to continue to stand up to the GOP and insist that there is no business as usual until investigations are truly underway. This is an excellent online training program for resisting at the federal, state and local levels. The online sessions make it easy for you to participate or study. Highly recommended! In the space of a week, a lot can happen, right?! 45 is busy digging his own grave but we must not get so focused on the drama, that we forget what this all comes down to: we need to win back Congress (and state and local governments) in 2018. The GOP has lost its way. And is obviously so corrupt, immoral, and cowardly, that it would throw our democracy under the bus to move its agenda forward. Let’s not trust them to get us out of this. We, the people, are our country's best and brightest hope! We must put our backs into it, kick these clowns back to where they came from, and steer our nation back towards democracy. Organize. Resist. Be beacons in this dark time for our country.